Astrologer, popular New Age writer--you read me all the time in Dell Horoscope. Need a reading--check my website. 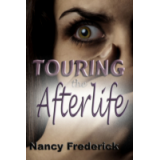 Author of many books and a brand new e-novel, a supernatural thriller, so please check out Touring the Afterlife at http://bit.ly/cMgrvw Thanks! Awash in despair, Addie swallows a handful of pills, expecting to extinguish her misery along with her life. She is dead but she isn’t gone. Instead she is trapped in the Afterlife, where Addie finds herself surrounded by loving guides and terrifying apparitions as she is forced to do what she’s most wanted to avoid—examine the key moments of her life. Can she release the notion of herself as a victim, offer forgiveness and embrace redemption? Can she die and live to see another day? This book spoke to me on so many levels. I loved it from the first moment I read it and the story has stayed with me. Addie was so multi-layered and intense, yet so easily relatable, her every awakening will stay with me forever. This book is a must read!